At this time of year, there are often two things happening in my kitchen. First, I am eating a lot of salads made from crunchy winter vegetables, because, well–even here in temperate Seattle–I know that tender lettuce is out of season in the dead of winter. 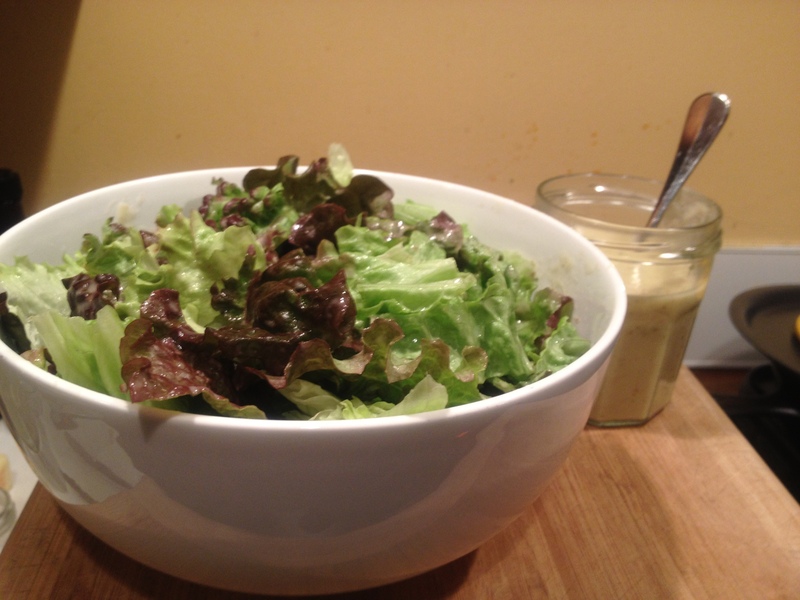 And I am starting to crave a salad that speaks of springtime, full of lettuce’s delicate crunch. The second thing that is often happening in my kitchen right about now is that a pear is lingering in the fruit bowl that is five minutes too ripe to be considered absolutely perfect. When these two events coincide–which, as I said, they often do at this time of year–I take it as an omen and make this salad dressing. Speaking of cookbooks, this recipe is from Moosewood Restaurant’s Cooking for Health. Of the many recipes I tried in that book when I first got it, I think this is the only one that stuck in my regular rotation. It probably says a lot about my expansive cookbook collection when I keep a cookbook for just one recipe. Although now that I’ve jotted the recipe down here, maybe I will move it along to make room for a new cookbook. If you were making room on your shelf for just one great new recipe collection, which would it be? This entry was posted in Salads, Vegan or Would-Be-Just-As-Good-Vegan and tagged cooking, food, recipes, salad, vegan, vegetarian on January 22, 2012 by emmycooks. With regards to the recipe collection, I have already made room for the “Whitewater” cookbooks. These are Whitewater Cooks, Whitewater Cooks at Home and Whitewater Cooks with Friends. There are some fabulous recipes in this collection. Like you, I need to move some cookbooks along to make room for the exciting new ones. Too many recipes – so little time! I have never heard of those cookbooks but I just did a search online and the recipes that came up look GREAT! The “at home” one (I always figure those will be the quickest recipes) is sold out on Amazon but I will check out the bookstores listed on their website next time I’m in Vancouver. Thank you for the recommendation! Inormally don’t like pear dishes, but the creamy sweet pear dressing is wonderful on salad greens with cranberries and walnuts!